Q: Can I recycle plastic bags? A: This is a question we get asked very often. From the bags you get with your shopping to the plastic bags, wrap and film that encase many of the items you buy. It is a huge problem that many cities are trying to address with regulations. The good news is that plastic bags and film are recyclable. The unfortunate news is that they are NOT recyclable everywhere. For example, San Francisco, which already has a plastic bag ban in place, just made it possible recycle plastic bags and other clean, dry film and flimsy plastic such as plastic wrap. See how it is being done at the W hotel in San Francisco. However in many other parts of the country, plastic bags CANNOT be placed in recycling bins because the loose bags tend to get caught in sorting machines at recycling facilities, jamming and damaging the equipment. RECYCLE ELSEWHERE – Bring your plastic bags to collection bins located at most grocery chains and drugstores. The website, www.plasticfilmrecycling.org, lists a directory of where plastic bags and film are recyclable in your area. Today, plastic pollution is a real threat. Millions of animals die because they ingest plastic bags or become ensnared in plastic packaging and other plastic items. The ocean is filled with trillions of microplastics that end up in seafood that we consume. One study found that 94% of drinking water samples in the U.S. revealed the presence of plastic fibers! 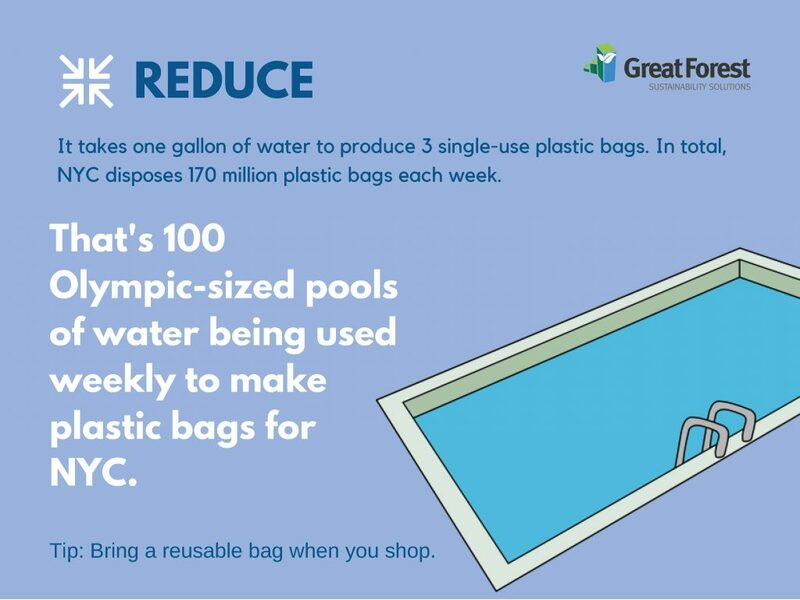 In addition, it takes one gallon of water to produce 3 single-use plastic bags (see the graphic above). That is a lot of wasted resources for a product that is often used once and then tossed. So the next time someone hands you a plastic bag, lets first look to REFUSE it.